According to new research, more companies are using more marketing agency partners than ever before and this is expected to continue to grow. The recently released report by SoDA (which surveyed director level and above marketing executives at some of the largest brands) shows that the increasing complexities of marketing (both digital and offline) is pushing business to partner and collaborate with marketing firms, and even more than one per company. The trend has some direct correlations with several factors that every small business should consider. But wait, you’re a small business so how could this possibly affect your local business, right? Wrong! Traditionally around the world, the larger brands and the agencies that they partner with are the catalyst that adopt technology, marketing platforms and tactics that ultimately roll down to the small business and even individual marketers. We have seen this within all aspects of the internet from websites to search, social media and even email marketing for that matter. When you see large brands embracing and scaling marketing strategies and trends, you can bet that consumers are responding to it and more importantly consumers will come to expect it from every business they come across. The SoDA study uncovers the details and trends that are progressing across the digital marketing space from the highest levels of brands, executives and agencies. The study reveals some extremely interesting facts about how brands are engaging agencies to bolster their marketing expertise and effectiveness. At the same time, the data uncovers the increasing trend that brands are partnering with more than one agency where specific digital marketing expertise may be needed. In 2014, just 13% of the company marketing executives surveyed stated that they were not using outside agency help, while 23% had hired at least 1 agency, 43% were using between 2-3 agencies and 21% were using 4 or more marketing agencies to assist with their marketing efforts. Jumping ahead to 2015, a whopping 27% of brands said they had taken their marketing completely inside and not engaged a single agency. 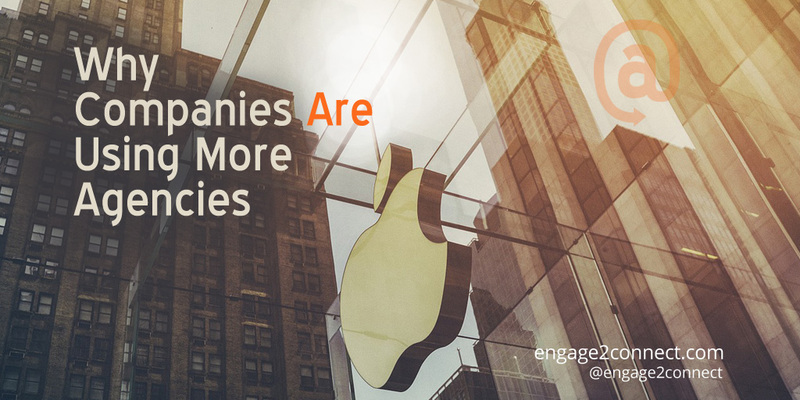 Yet a whopping 32% were now using at least one marketing firm, leaving 41% engaging between 2 and 5+ agencies. Now with the current report, it appears there are some fairly dramatic shifts accuring. Now just 13% of brands are doing their marketing inhouse, exactly as we saw in 2014 and currently only 20% have hired a single agency. But here’s where things get really interesting. A massive 52% of brands are using 2 or 3 marketing agencies and 15% are using at least 4 or more. That’s 67% of some of the largest brands using outside marketing help are engaging numerous outside agency partners to execute their marketing this year. As we reviewed this study, we were not surprised to find that what we already knew with our small business clients is holding true with large brands and agencies. The study shows that there are numerous factors driving the increase and need for outside agency help. 1- The general complexity and volume requirements of new/digital marketing tactics, strategies and technologies are expanding rapidly. 2- Increased budget spending. The study outlines that 55% of brands are increasing either their overall budgets or increasing their spending on digital marketing specifically. This increase in spending signifies that costs and expertise requirements are rising and that other traditional marketing channels are decreasing results. Once again, we were not surprised at the priorities where larger brands are increasing their marketing budgets. It aligns with what we are already doing for our small business clients. Let’s look at the top three areas brands are increasing marketing spends. Digital Experiences 82% – As the top area that large brands are focusing on increased spending, digital experiences may be a term that many small businesses are not familiar with. Look at digital experiences as the results and feelings a customer has before, during and after an interaction with content from your brand. It is directly connected to content creation, but moves beyond content development into the lasting emotion and actions taken while engaging with the content. Think of it as the next level of branding. Content Development 76% – The second highest marketing component that brands are increasing spending on is content development or what is sometimes referred to as content creation. Content development involves everything from writing blog posts, creating white papers, developing visual graphics, photos and videos. As consumers flock to content online, brands are increasing their budgets and volumes to keep pace with the voracious appetite for new innovative content that engages customers, drives traffic and increases results from search and social media efforts. Other Digital Projects 71% – The most general component receiving additional spending is digital projects. This can include everything from expanding or upgrading websites, improving overall company digital infrastructure and other non-content related digital components. This category also seems to be directly related to spending that is covered under “digital transformation” of these businesses, which would also include expanding the organization’s overall digital integration from operations, non-marketing related platforms, applications, tools and services. It is important that our small business readers take note of the factors listed in this piece, because these are the things that are trickling down to your small business. As larger brands increase marketing budgets, add expertise and expand the technologies, platforms and the quality of what they are doing, it impacts the way consumers think. Consumers then spend more time with these platforms and engage with higher quality content, thus increasing their expectations when seeing other brands. Small business needs to understand that these digital marketing changes do directly affect them and the digital habits and expectations of consumers must be addressed. As a progressive small business marketing agency, we work with clients across the country that realize the same factors that we cover here. Their ability to keep up with the latest complexities of digital marketing has become unsustainable and their marketing results were reflecting that. They come to us to not only develop strategy, but execute all things digital marketing related, so they can finally get back to their expertise and focus. The numbers, trends and history do not lie. Local business and small business owners are going to have to consider what’s next for their marketing. Just like the small businesses that didn’t adapt to the internet and are now long gone, the small business that doesn’t adapt their digital marketing execution will be also. We could lie to you and tell you what you want to hear, but we always tell our contacts what they need to hear instead.